Drain the water from the tofu packages. Wrap the tofu blocks into paper towels and press down onto the blocks squeezing as much water as you can out of the tofu. Cut tofu blocks into 1 inch cubes. Place cubes into a tupperware container. Put all pad thai sauce ingredients into a blender (there is no need to chop or mince your ingredients because they are going to be blended anyways in the blender = minimize the time to prep the sauce). Blend sauce until it is smooth and thick. Pour the pad thai sauce over the tofu and let tofu soak up the sauce overnight or at least 1 hour. Pour marinaded tofu into the crockpot along with the sugar snap peas, coleslaw, bean sprouts, and pinto beans. Mix all the crockpot contents together. Cook tofu for 6 hours on LOW (2-3 hours on LOW). Strain Pad Thai to reduce excess liquid that may have been released from tofu and vegetables. Pad thai tofu is ready to be served! Optional: Steam a large handful of fresh spinach in the microwave for 1.5 minutes and place a serving of the pad thai on top! 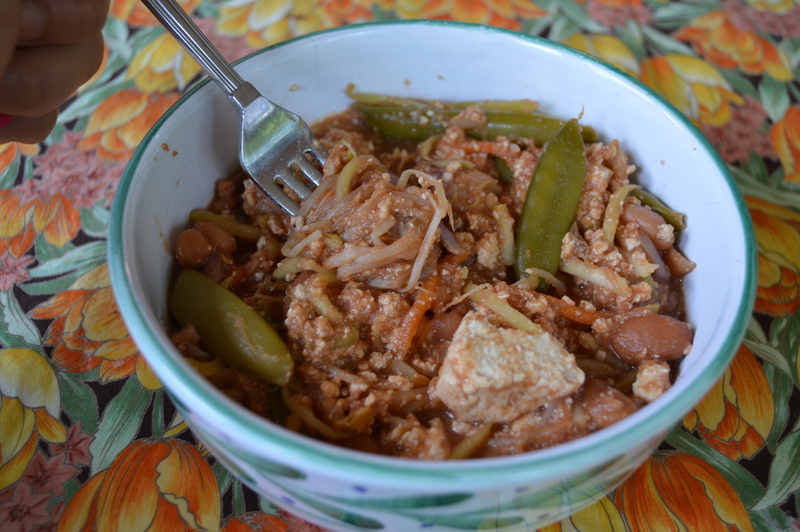 Recipe featured in my post, Mock Sweet N Spicy Crockpot Tofu Pad Thai!